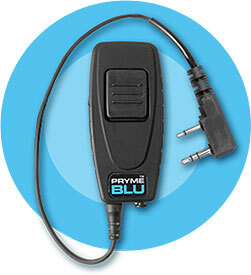 The PRYME BLU Adapter allows you to use a compatible wireless Bluetooth headset or other audio accessory with your two-way radio. The PRYME BLU Adapter is compatible with thousands of off the shelf consumer audio accessories and pairs easily, allowing you to operate wirelessly. Allows you to use a wireless Bluetooth headset with your two-way radio in place of a speaker microphone or wired audio accessory. Easy pairing process. Remembers paired connection to the wireless headset even if powered off or removed from the 2-way radio. Most (multi-pin connector) models are powered by the radio and do not require any batteries or charging. Simple pin models have an internal Li-Ion battery pack and must be recharged between uses. Status LED indicates connection to a compatible wireless accessory. 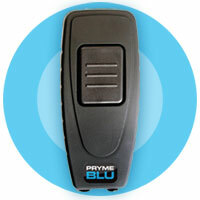 The PRYMEBLU® PTT allows you activate your radio’s Push-To-Talk function wirelessly, when using a PRYMEBLU® Adapter and paired Bluetooth headset. The BT-PTT can be held in the hand, worn on a lanyard, or secured to just about anywhere using the Velcro® fastener! Easily attaches to your duty gear, automobile steering wheel, or any convenient location!